The general aim of this study is the documentation of the contact situation and the characterization of the mutual influences that the languages of Guinea are subject to. In the focus of the analysis we have the Fula variety Pular on the one hand, and the varieties of Manding (Kakkaɓe, Jaxanka, Garanke) as well as the languages of the Soso-Jalunka group which are spoken within and adjacent to the Fuuta Jaloo region, on the other hand. Special attention is paid to the effects that the contact has had on the phonology and morphology of the respective languages. It is hoped that on the basis of this description, more insight into the phenomenon of language contact will be gained, the more so as the mentioned languages show different typological features. The integration strategy of borrowed linguistic data (sounds, words, structures) seems to be subject to the logic of adaptation or assimilation in both directions – in this case from Fula to Mande and from Mande to Fula. This means that the structural constraints of the receiver languages determine which form foreign sounds or sound sequences like phonemes, syllables, lexemes or sentence structures will take. Besides time, two other factors play a crucial role in this process: the typological distance between the contact languages and the demographic balance among the speakers. On the one hand, mostly due to the influence of Mande languages on Pular, this variety presents many features which distinguish it from other Fula dialects: the nasalisation of the final vowel, the loss of initial sound alternation on verbs, sporadic changes on the canonical structure of the noun phrase, etc. On the other hand, some Mande varieties like Jalunka and Kakkaɓe as well as Garanke are strongly affected by the influence of Pular. This leads inter alia to a large amount of Fula loanwords in their lexicon and the presence of implosives (ɓ, ɗ and ƴ) in their phoneme inventory. The study is divided into three parts distributed over eight chapters. Part I contains an introduction to the research areas within the Fuuta Jaloo and the immediate surroundings, deals with the history of contact between Pular and Mande speakers and contains a contrastive description of phonological and morphological characteristics of the Mande languages spoken in the research area. In the second part the contact situation is looked at from the perspective of Pular (i.e. the influence of Mande on Pular is treated) and in Part III it is described from the Mande point of view (i.e. it is dealt with the influence of Pular on Mande). Furthermore, parts of the data collected (free recordings of narrations or conversations as well as word lists) are included in the book. The study on language contact in Guinea provides rich documentation of language contact in a well-defined sociolinguistic setting. The collection of linguistic data is supported by good recognition of linguistic geography and of the languages policy in the area under investigation, as well as by the proper identification of authentic discourse situations that might be relevant for the study. [...] The analysis which is made on serious methodological grounds provides more insight into the phenomenon of language contact. It presents processes which affect systems that are considerably different. It also provides an explanation for the changes in the morphophonology of Pular that make the Guinean variety significantly different from the other varieties of Fula. 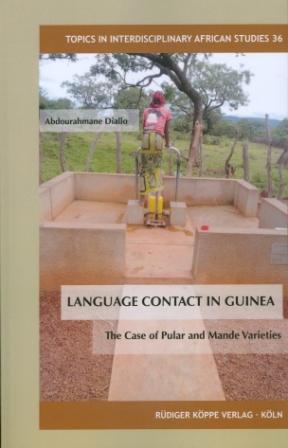 As for the Mande languages spoken in Guinea (especially Kakkabe and Jalunka spoken in the Fuuta Jaloo), the study gives evidence for divergence processes within Mande languages that separate languages influenced by Pular from the other Mande languages spoken in Guinea.